Sometimes we all need a simple card and this one fits the bill. The background is a piece of card stock with Antique Glimmers technique. 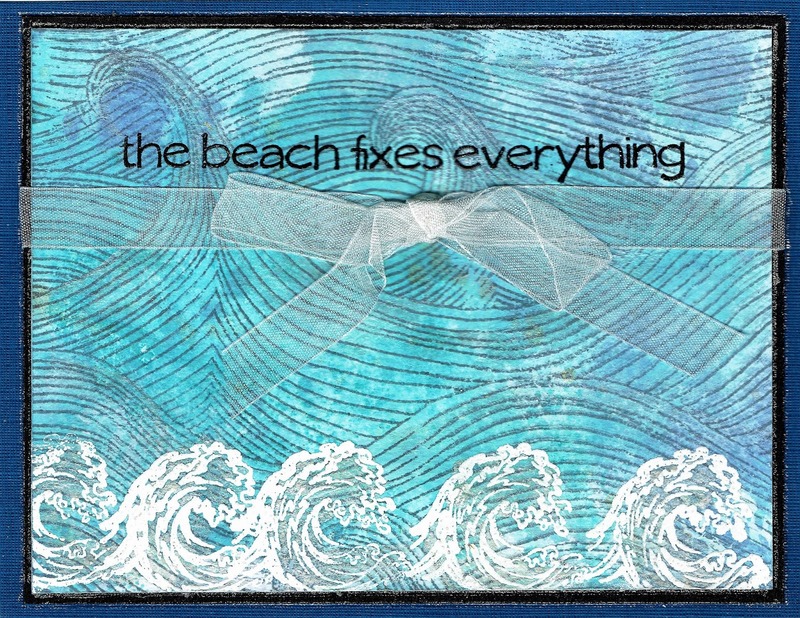 It was already stamped with the Technique Junkie Stamp Sea Waves - http://techniquejunkies.com/sea-waves/. 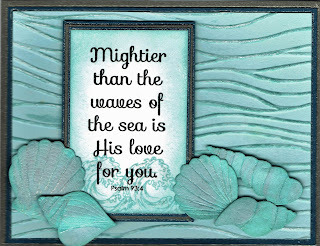 I then stamped the wave stamp from Technique Junkies Stamp set- Psalms of the Sea - http://techniquejunkies.com/psalms-of-the-sea-set-of-6/ . It was stamped several times with white pigment ink and heat embossed with opaque white embossing powder. 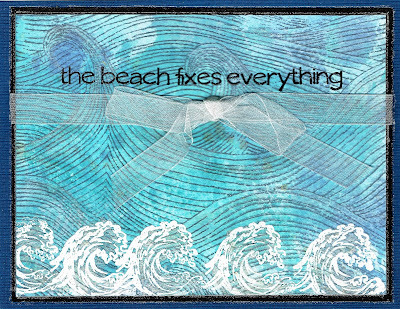 I also used the verse The Beach Fixes Everything - http://techniquejunkies.com/the-beach-fixes-everything/ and heat embossed it with black embossing powder. A white ribbon finishes the card. 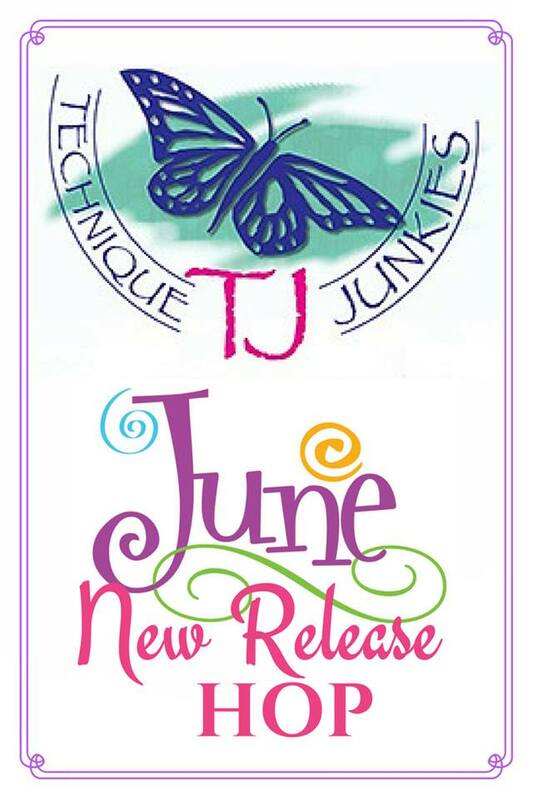 The July Technique Junkies new releases will be featured in a blog hop on July 1. Make sure you plan to hop with us. Layers and a string of pearls finish my card. on the background. 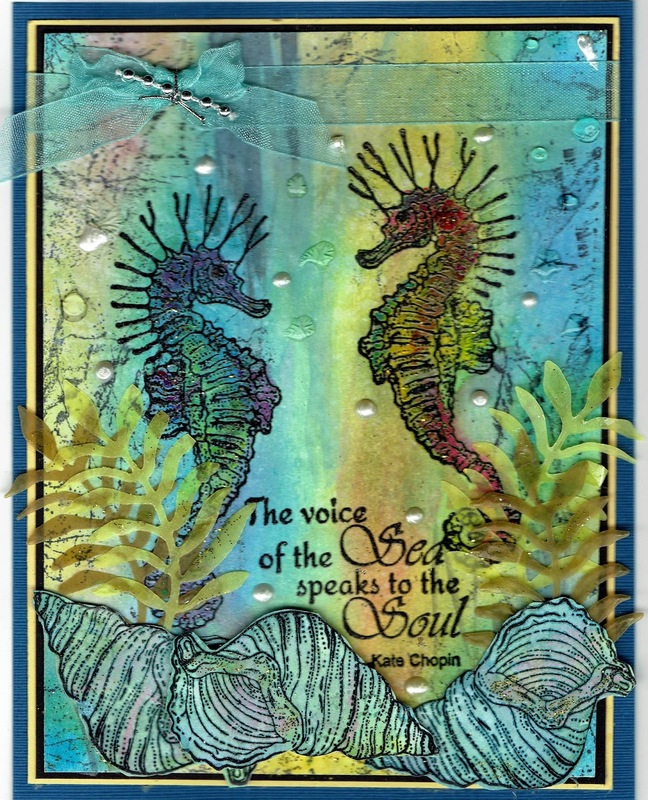 All of the other stamps are from Technique Junkies Stamp set Sea Horses - http://techniquejunkies.com/seahorses-set-of-4/ . They were stamped with black Versafine ink and heat embossed. 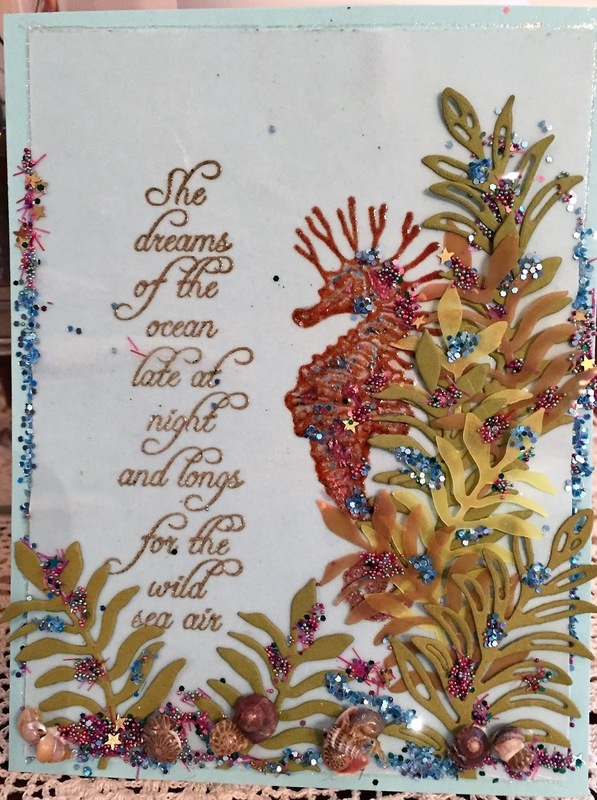 I used Twinkling H2Os to color in the seahorses and the shells which were fussy cut and adhered over the punched out vellum seaweed fronds. I used Nuvo drops randomly to represent bubbles in the ocean water. A ribbon bow and pearls were my final touch. Have a wonderfully stamping day, and get inky! 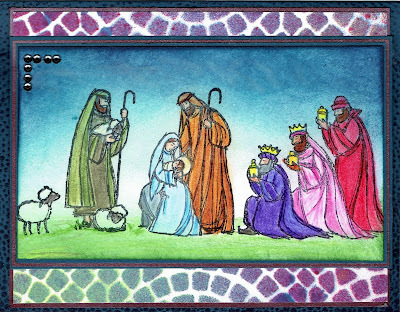 This is the first card I have created for Christmas this year. Usually I have a simpler design because I mass produce about 125 cards every year. Cards that are too fussy, are difficult to mass produce do not get made in mass quantities. This is one of them. But I recent;y purchased the Chameleon Colortone Pencil (http://techniquejunkies.com/chameleon-colortone-pencils/) and I wanted to try them out. I think they worked beautifully. The stencil is from Technique Junkies web store (http://techniquejunkies.com/circle-mosaic-stencil/) and was colored with Art Anthology Colorations sprays (http://techniquejunkies.com/products-and-accessories/art-anthology-products/). This particular piece was one of those from card parts baskets, and I just thought it went with the colors I used when coloring the images. 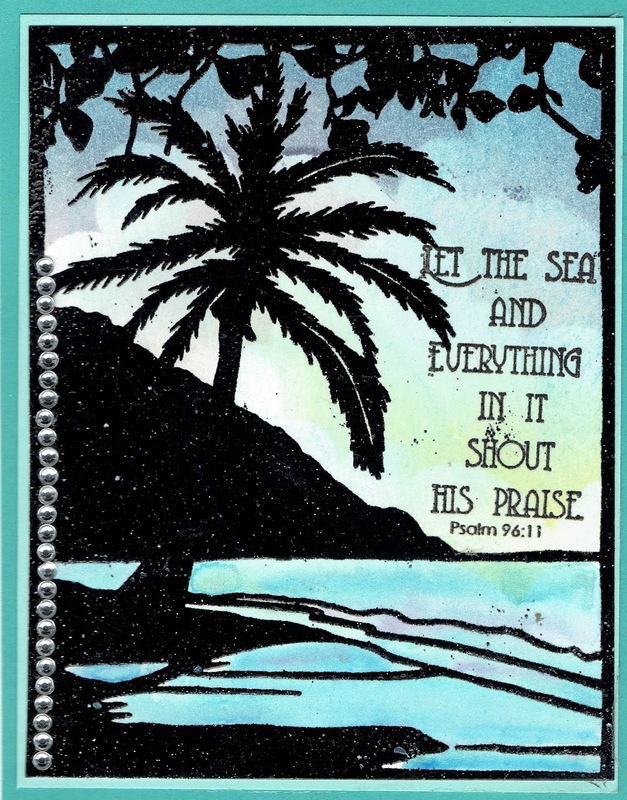 The stamped images are from Stampin' Up and are retired. The Chameleon pencils were easy to use and blended very easily and very well. Although they do not say they are made a waxy substance, it appears as though they are. On a previous card, I tried using the Wink of Stella over the colored image, and there was some kind of chemical reaction, Instead of turning shimmery, the colored image turned white! So now I know to not use those two products together! Layers of card stock, some bling, and the card is ready to go! 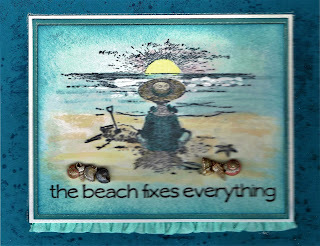 The month of June seems to have us thinking about beaches, and sand, and ocean water, and sea shells. http://techniquejunkies.com/starfish/ . I stamped them and watercolored them, let dry, fussy them out, and layered them. Some of the shells have dimensionals under to give the shells different heights. 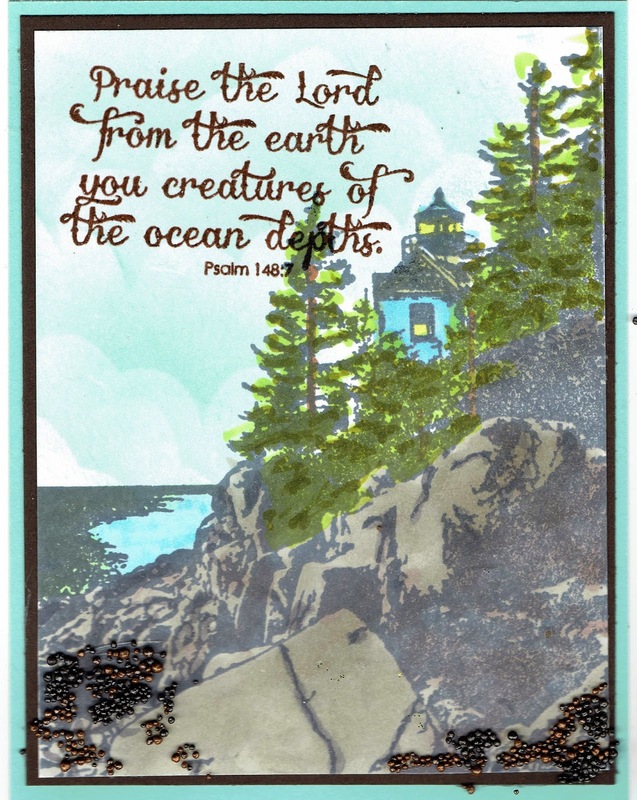 The verse came from this Technique Junkies Stamp set: http://techniquejunkies.com/psalms-of-the-sea-set-of-6/ . 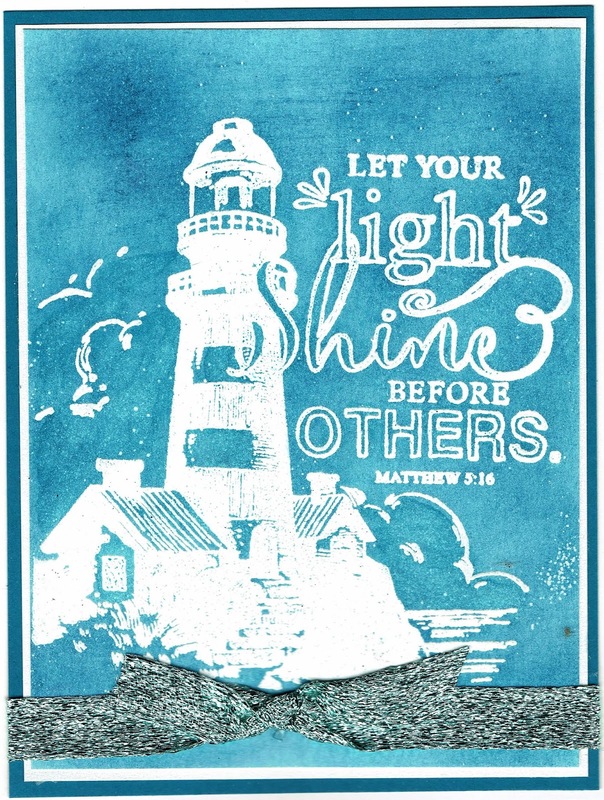 The verse is stamped with brown Versafine ink and heat embossed with clear embossing powder. I hit a wet watercolor brush with paint to make the splotches, and I added Nuvo drops for additional visual texture on the card. The dry fairly quickly to touch but take sev eral hours to become hard. 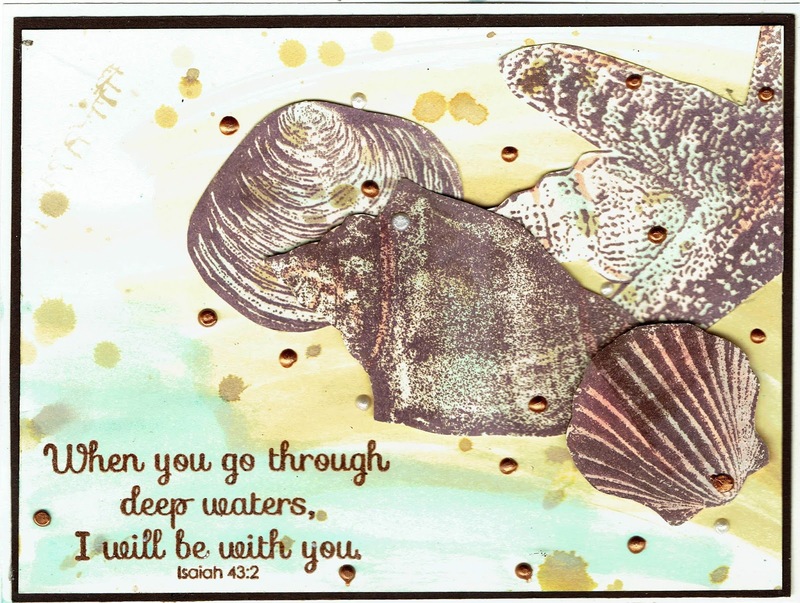 Take some time to stamp, and get inky! 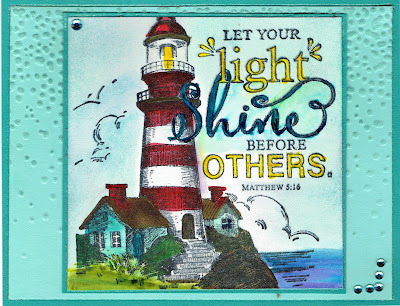 Today I used the newly released Technique Junkies Let your Light Shine stamp http://techniquejunkies.com/let-your-light-shine/ to create my card. used one of the wonderful A Colorful Life stencils - http://techniquejunkies.com/search.php?search_query=A+colorful+life+stencils - along with the gold Nuvo Mouse - http://techniquejunkies.com/nuvo-products/ to create the background for the focal image. I used the Twinkling H2Os to paint the focal image. I wanted to use a different verse than the verse that is a part of this stamp. So I was very careful to not get any Memento ink on the verse. However, the "S" that is a part of the verse is also a part of the lighthouse and I had to decide how I was going to treat that "S." I painted it gold and added a gold ribbon bow. Then I stamped the verse from the Psalms of the Seat set - http://techniquejunkies.com/psalms-of-the-sea-set-of-6/ with Versafine black ink and heat embossed it with clear embossing powder. A burlap ribbon over layed with the matching ribbon finishes my card. Please remember that you can get a 10% discount by using the code TJ10Judy on your order. I used one of the wonderful A Colorful Life stencils - http://techniquejunkies.com/search.php?search_query=A+colorful+life+stencils - along with the Nuvo Mouse - http://techniquejunkies.com/nuvo-products/ to create the background for the focal image. I used Twinkling H2Os to color in the image. 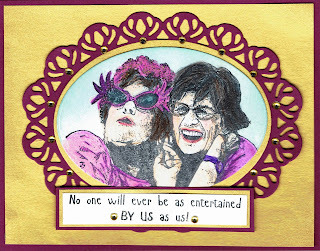 A ruffled ribbon and some bling finish my card. 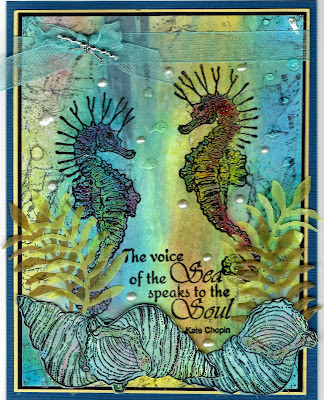 Today I used the newly released Technique Junkies Seahorses set - http://techniquejunkies.com/seahorses-set-of-4/ to create my card. I have no seaweed stand so I free-hand painted the sand and sea weed with Twinkling H2Os. I also used the Twinkling H2Os to paint the seahorses. 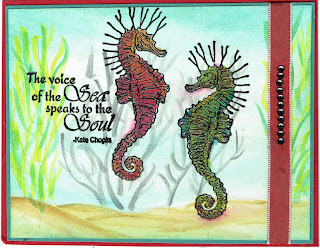 I had no real idea exactly what color seahorses are in real life - I tended to think of them as a tan color. So I googled seahorses and discovered they can be all kinds of colors depending on what is happening around them. If they were trying to hide, or look for a mate, or if they were irritated about something their colors would change. I wrapped a ribbon about the focal image layer and added some stick-on beads for texture and visual interest. Please remember that you can get a 10% discount by using the code TJ10Judy on your order. Distress Oxide inks excluded from this discount as they are already discounted. I used a new Technique Junkies June stamp release to create this card. 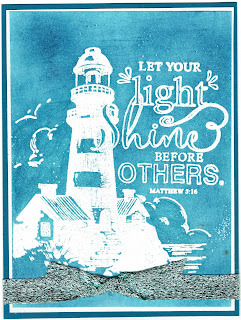 The name of the stamp is Let Your Light Shine - http://techniquejunkies.com/let-your-light-shine/. I heat embossed it with white opaque embossing powder. Then I burnished blue ink over all of the white space on the card stock. A ribbon was tied around the bottom and Ta-Da - the card is almost done.Then all of the above was layered on white card stock which is why it is hard to see the bottom layer. Don't forget all Technique Junkie June release stamps - http://techniquejunkies.com/june-2017-release/ - are on sale 15% off through June 8, 2017. And if you order anything else besides June release stamps you can get 10% off by using this code - TJ10Judy. Please join us over at the new Technique Junkies Facebook Group to share your work. I colored in the image with my Copic markers and added a few Prills. Then I stamped the verse in brown Versafine ink, covered it with clear embossing powder and heat set it. I sponged in the sky. And if you order anything you can get 10% off by using this code - TJ10Judy. Distress Oxide inks are excluded from this coupon. This stamp reminds me of one of my sister-in-laws. She has long time friends from grade school and she is in her 80's! I used this one Technique Junkies set - By Us - http://techniquejunkies.com/by-us/. 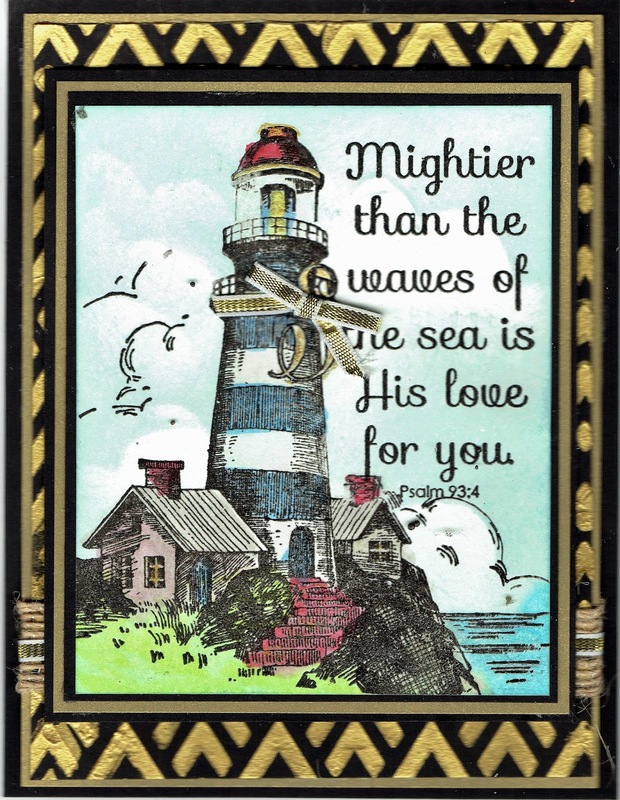 The image is colored in with my new Chameleon pencils, then die cut out and framed with a border and layered again. This is an "oldie"stamp. The pencils are fun to use and really helped to give texture and definition to her hair. Remember you can get a 10% discount on most anything else (there are a very few exclusions) with the code TJ10Judy. Distress Oxide inks are not discounted. goes with the Beach Girl image wonderfully! I painted the scene with Twinkling H2Os and glued on some real sea shells. A ruffled ribbon border is a wonderful embellishment. Technique Junkies background stamps Key Script - http://techniquejunkies.com/key-script/ and Wasted - http://techniquejunkies.com/wasted/ - were used to add interest to the base card stock. 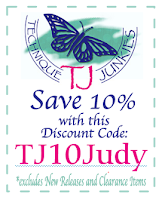 And if you order anything else besides June release stamps you can get 10% off by using this code - TJ10Judy. Distress Oxide inks are not discounted. 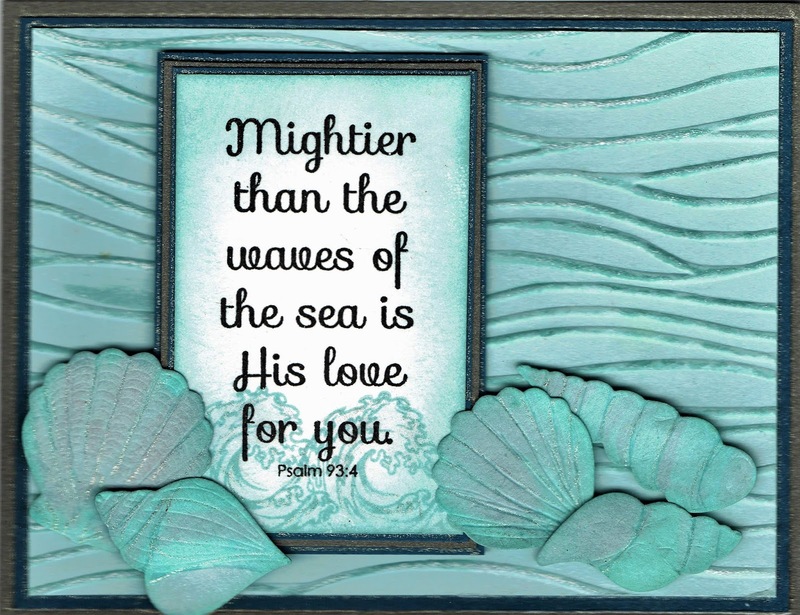 I created this card using one of the Technique Junkies June releases - Psalms of the Sea - http://techniquejunkies.com/psalms-of-the-sea-set-of-6/ . I used a light blue card stock and an embossing folder. I added ink to the embossed lines and a little white opaque embossing powder and there but not all over. The verse is also heat embossed with detail black embossing powder. 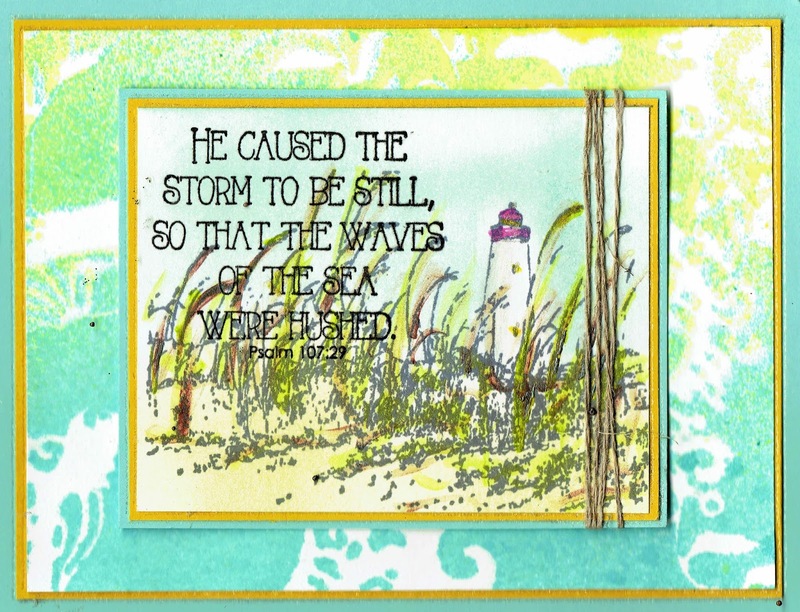 The wave stamp is stamped twice over the verse. 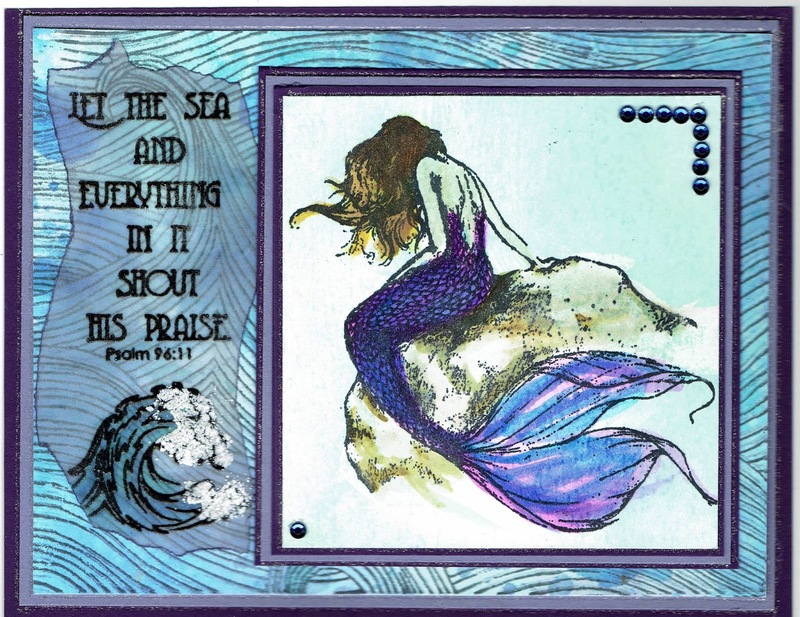 I used die cut shells and water colored with pink and blue inks. I used the detail end of the matching blue marker to put in faint lines on the shells and used foram tape to "pop" them up. 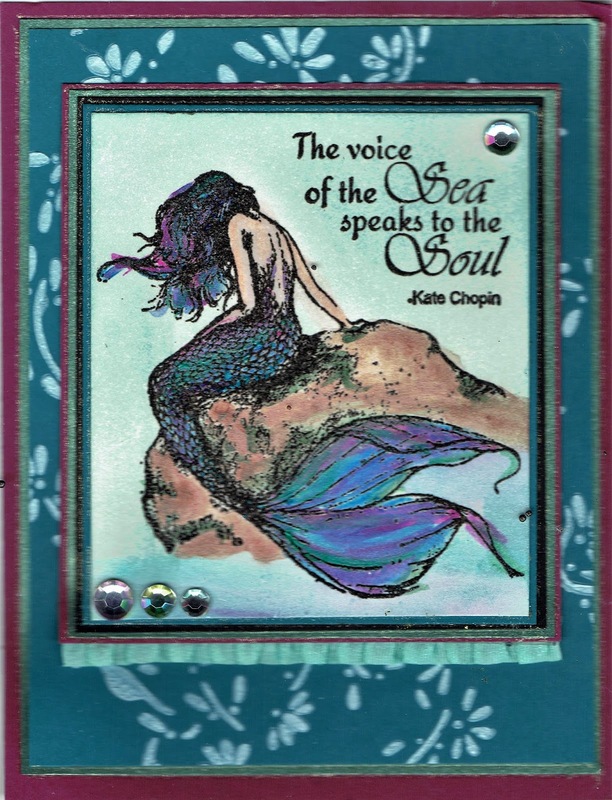 The verse and the embossed card stock is layered on a darker blue and then on dark silver-gray glimmer card stock (not text weight). I sponged around the verse. Have a wonderful Saturday -- and get inky! 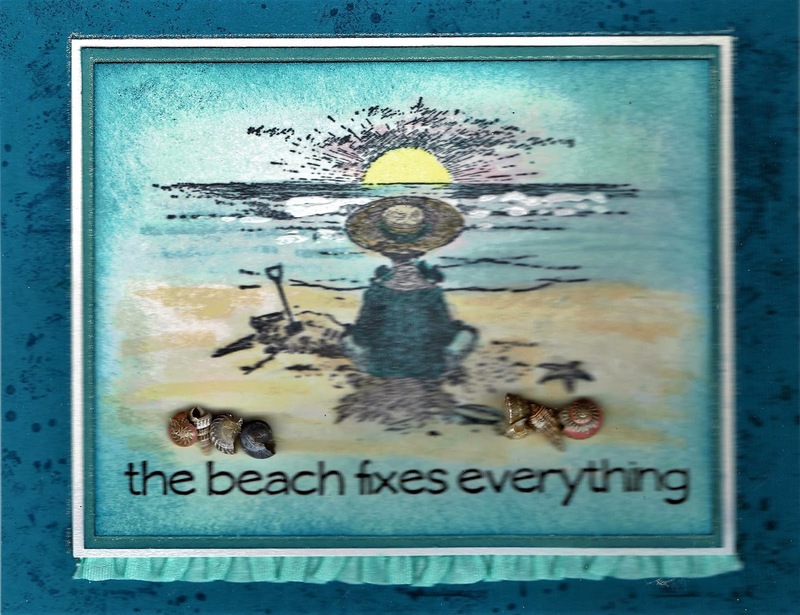 Seaside Blog Hop for June! New Stamps! New Sale! Happy June 1! And Happy June Release Blog Hop Day! This is always a happy day to release new stamps and see what everyone does with the new stamps. I have four cards for you today and each one features at least one newly released Technique Junkie stamp -- And of course all of the stamps featured on my cards today are found at http://techniquejunkies.com/. I will give you the direct link for each stamp used on each card. The Blog Hop starts here: http://techniquejunkies.blogspot.com/ . And as usual, Pat has all of the Technique Junkie June Release stamps on sale from now through June 8. Please go shopping here -- techniquejunkies.com/june-2017-release/. 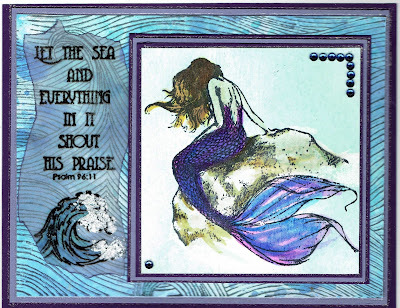 My first card features the new stamp Mermaid on the Rock - techniquejunkies.com/mermaid-on-rock/ and the greeting is from Psalms of the Sea - techniquejunkies.com/psalms-of-the-sea-set-of-6/. I used Twinkling H2Os to color her and the rock. The sky is sponged. The verse is tamped on vellum, sponged around the edge while still on the Xyron backing sheet. The wave is colored with Twinkling H2Os. I also used Sea Waves - http://techniquejunkies.com/sea-waves/ - over Antique Glimmers. My second card uses one stamp - Let Your Light Shine - techniquejunkies.com/let-your-light-shine/. It is colored with Twinkling H2Os. 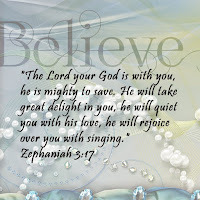 I used an embossing folder for the background. 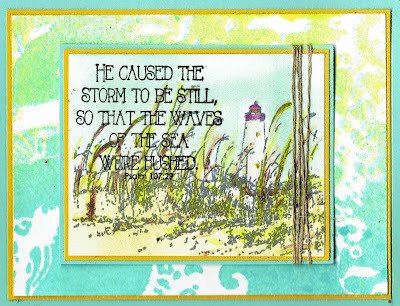 My third card uses one stamp from Psalms of the Sea - techniquejunkies.com/psalms-of-the-sea-set-of-6/, and Seagrass Lighthouse - http://techniquejunkies.com/seagrass-lighthouse/ . I used Twinkling H2Os and I sponged in the sky. 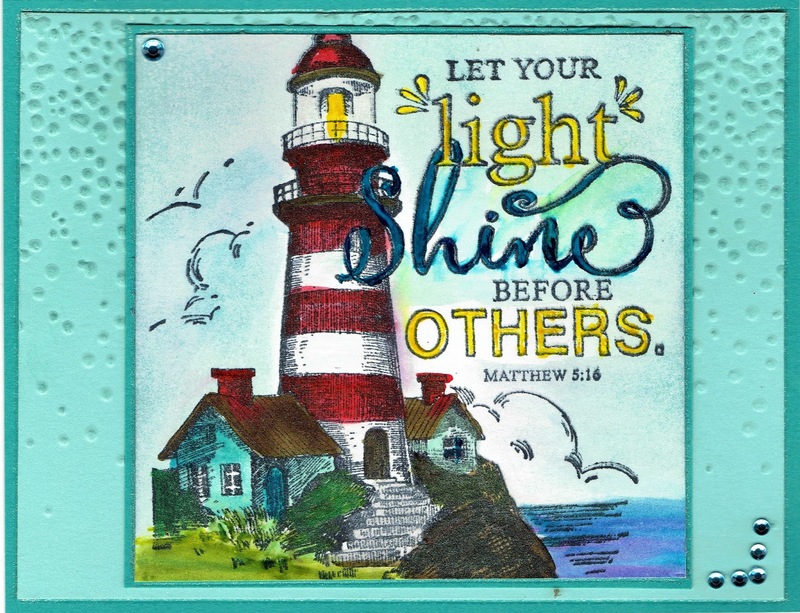 The background is created using A Colorful Life stencil along with Art Anthology Coloration sprays. My last card uses 2 new June Release stamps - Seahorses - techniquejunkies.com/seahorses-set-of-4/ , and Wild Sea Air - techniquejunkies.com/wild-sea-air/. Both the verse and the seahorse are stamped on Vellum and heat embossed with clear embossing powder over brown Versafine ink. The vellum is adhered to the base card with Xyron adhesive. I die cut various leaves to imitate seaweed and other sea foliage. Then I added dots of Tombow glue here and there and added Prills to add dimension. Tiny Sea shells were also adhered to the bottom. Did you know that Technique Junkies now has a Facebook group? Please join us over at the new Technique Junkies Facebook Group to share your work. Click on the link, and there is another place to request to join. One of the team will approve you. Please make sure you follow the hop links below and hit every blog. You will not want to miss this hop. 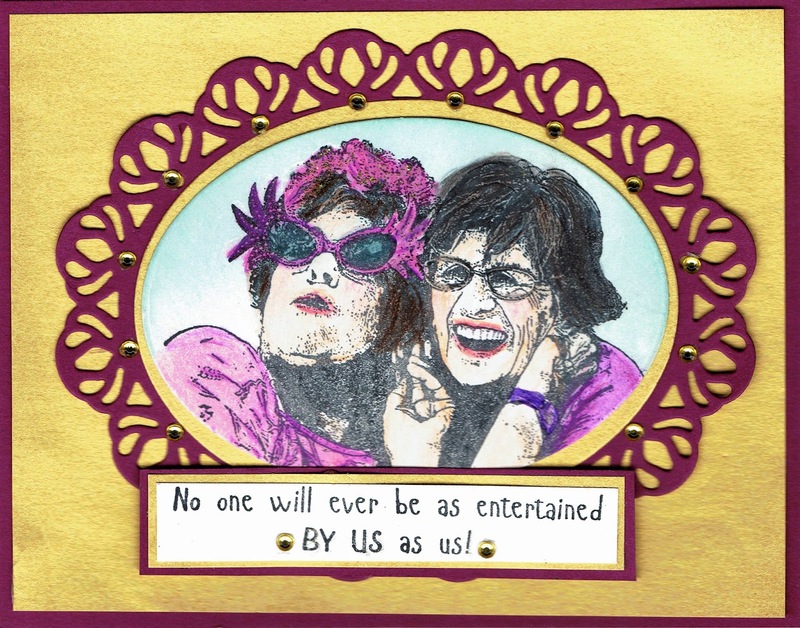 I have seen several of the cards in our private Design Team group and they are wonderful! Then do not forget about the sale of 15% off for all of the Technique Junkies June Release stamps! You can find them all here - techniquejunkies.com/june-2017-release/. If you wish to order other items you can use the coupon code on my side bar to get 10% off of your order.